Kingsgate and its Thai subsidiary, Akara Resources Public Company Limited, operate the Chatree gold mine in central Thailand, 280 kilometres north of Bangkok. Chatree is a large scale, low-grade, open pit gold mining operation located in central Thailand. 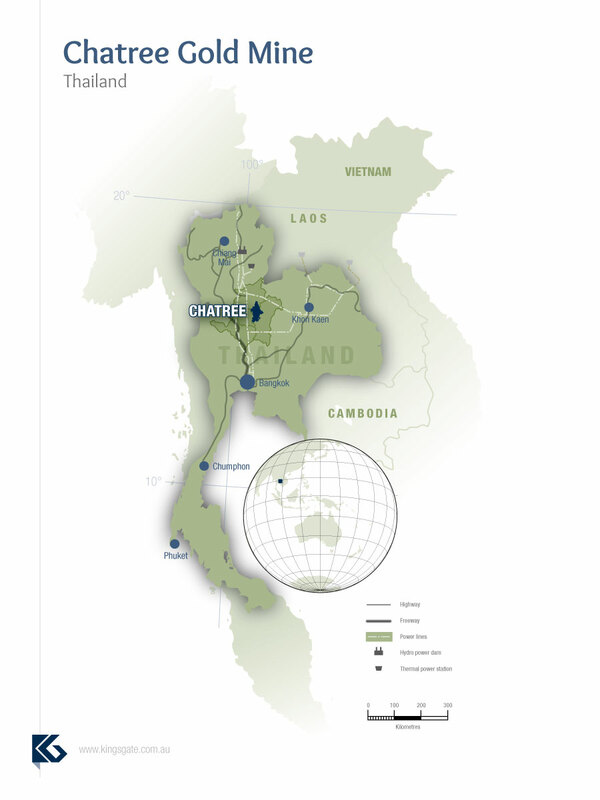 Chatree continued as Kingsgate’s primary production asset for the year ending 30 June 2015, producing 125,094 ounces of gold and 850,003 ounces of silver. Chatree is a world class gold mine that operates under strict environmental, safety and quality standards and is proud to be ISO14001 (Environmental), OHSAS18001 (Safety) and SA8000 (Social Accountability) compliant. In addition, Chatree was one of the first signatories to the International Code of Cyanide Management. There were no Lost Time Injuries recorded the year ending 30 June 2015, and Chatree has achieved an impressive four million man-hours of operations and construction activity since its last Lost Time Injury. Management acknowledges this effort and continues to congratulate all employees and contractors for their attention to safety and care for each other. In recognition of our safety standards and emergency response preparedness, Chatree received the “Thailand National Occupational Health and Safety Award 2015” on 2 July 2015. This is the eighth consecutive year that Chatree has received the Occupational Health and Safety Award. Total mill throughput for the year ending 30 June 2015 was 5.3 million tonnes, which produced 125,094 ounces of gold and 850,003 ounces of silver respectively. Total production costs after depreciation and amortisation were $US973 per ounce of gold produced. At 30 June 2015, 9.4 million tonnes of ore was stockpiled with an average contained gold grade of 0.49 grams per tonne (g/t) representing 144,496 ounces of gold. Mine production was improved through better equipment availability and the implementation of several joint maintenance improvement projects between Akara, our mining contractor LotusHall, and their main maintenance supplier. During 2014/2015, the mining sequence was modified to focus on the higher-grade ore in A Pit and 4.77 million tonnes of ore was mined, with a waste-to-ore strip ratio of 0.6:1. The average head grade of mined ore was 0.91g/t gold, and 13.1g/t silver. The introduction of Blast Monitoring Technology in September 2014 continued to provide positive results and reduce the chance of mis-classification. Work on optimising the drilling and blasting parameters continued throughout the year, including design orientation to geological structures, varying hole-size and burden-to-spacing ratios. Three days of production were lost due to significant rainfall events during 2014/2015. The reinstatement of the section of Highway 1301 that passes through C North Pit was completed during the second half of 2014. Tailings Storage Facility No. 2 was completed in April 2015, which provides additional tailings storage capacity. Plant No. 2 continued to perform well in 2014/2015 with an average availability of 97.6%, and Plant No. 1 operated with an average availability of 98.0%. Work continues to eliminate processing bottlenecks and maximise recoveries which are sometimes caused by carbonaceous material associated with one of the fault structures identified in the base of the A pit. A number of plant operating and material blend adjustments have seen improved recovery rates.